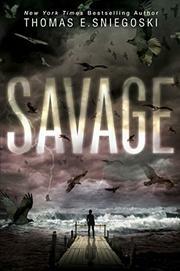 Three teens are trapped when a hurricane hits their New England island with more than just wind and water. Animal lover Sidney works for the local vet and adores Snowy, her deaf, white German shepherd. When the storm hits, she is with Cody, whom she’s recently broken up with, and Rich, who secretly has a crush on her. The teens shelter in Rich’s vacation home but find themselves under attack from thousands of insects swarming up from the basement. The scene shifts to different venues, where different characters are attacked by similar swarms of animals, including formerly loving pets. Psychodramas—such as Sidney’s romantic travails and various neighbors’ own idiosyncratic problems—play out against the chaos. Sniegoski rarely lets up on the galloping suspense, putting his characters (almost all presumably white) in a few too many impossible-to-escape situations but keeping pulses pounding. Each time a character frantically tries to unlock a door while pursued by savage animals, be sure that character will drop his or her keys. Gruesome scenes abound, with characters eaten alive by swarms of insects, rats, squirrels, and domestic pets, including one in which birds kill a character, up close. The cause of the chaos is nicely sci-fi, thankfully without involving a mad scientist, and clearly, it’s going to get worse in the sequel.